The quinoa field Blake Richard farms in Loleta. Let's say you first heard of quinoa reading about the winner of a local recipe contest and you decide to try making the new dish for dinner. They call quinoa an "ancient grain" but you only started hearing about it a couple years ago — a healthy, gluten-free rice substitute. Not as heavy as rice, you heard. Quicker to cook. Pronounced "keen-wah" — maybe it's French or Lebanese? You're in the rice and grains aisle at the store, so you decide to buy some. You heard it might actually grow in Humboldt and local quinoa sounds more sustainable than importing it from some former French protectorate in Africa. If you look at the right store, you might find one variety with a "Grown in Humboldt County" logo on the bag — Lundberg Family Farms' Organic Tri-Color Blend. Wow — it retails at more than $8 a pound! Sticker shock gets you poking around the other brands and you soon learn quinoa is ancient to Bolivia and Peru. The closest you can get to Humboldt is Canadian, which is cheaper but still imported. It's Local Food Month so Lundberg it is. The Chico-area Lundberg company got into Humboldt quinoa in a big way in 2015 and that tri-color blend on the shelf is most likely grown on Lundberg-owned land in Loleta by local farmer Blake Richard. It's a boom-and-bust story that leaves Richard scratching his head about the future of quinoa in the region. "Lundberg wanted to see quinoa become as big as rice," says Richard, who's farming about a quarter if the quinoa he was in 2015 for about half the price. "We can't compete with the price of Bolivian quinoa. The boom went up quickly and the bust came instantly." To North Americans, quinoa was an obscure Andean plant (related to spinach and amaranth) denigrated as "Indian food" until the 1980s. Highland peasants in Bolivia and Peru had made a staple of quinoa seeds since the days of the Incan Empire. It grew like crazy in dry, harsh conditions. Popularity grew slowly around the world until the early 2000s, when European, American and Asian demand exploded. Three food trends led the explosion, according to food anthropologist Emma McDonnell: American interest in gluten-free foods, vegetarian and vegan quests for complete-protein plants and the marketing of "superfoods" with dense nutrient content. Between 2000 and 2011, South American exports of quinoa soared six-fold. The United Nations' declared 2013 the International Year of Quinoa, urging the entire developing world to feed itself with the hardy seed. With the boom came skyrocketing prices. McDonnell found that Bolivian farmers were getting 25 cents a pound in 2000 — by 2014, a pound brought $4. 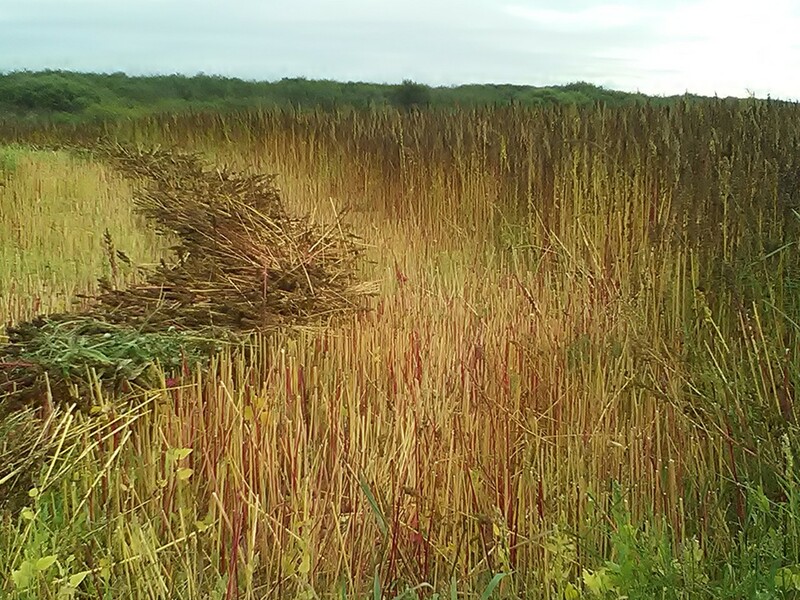 Andeans stopped eating their own staple and halted other traditional farming to make more acres available for cash-crop quinoa. 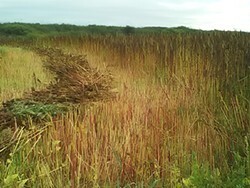 In North America, Lundberg Family Farms believed quinoa would grow better in temperate Humboldt County than on its relatively hot farmland near Chico. With the help of Richard and other local farmers, Lundberg made a big investment in quinoa. Richard worked more than 300 acres of Lundberg-owned land between Loleta and Point Arena in Mendocino County, looking for sweet spots where the temperatures didn't get too high and the rains didn't come before harvest. He says Lundberg was paying $2 a pound, high enough to pencil out yields on land where cultivation, harvesting and processing costs run no less than $1,500 per acre. Processing includes stripping the bitter saponins from the seeds, rinsing any residual dust and drying for market. "They encouraged me to grow as much as I could," Richard says. "They were ready to put every resource they had to get ahead of the game in quinoa." In hindsight, it looks like Lundberg's jump into the quinoa boom might have been a couple years too late. McDonnell's ethnographic fieldwork revealed that Peruvian coastal farmers started replacing rice, asparagus and other commodities with quinoa. Egypt, India and China launched quinoa production programs. By the time Richard was harvesting his first quinoa crop in Humboldt, global production had outpaced demand. Bolivians were selling quinoa for 60 cents a pound. "Lundberg put the brakes on," Richard says. "They needed to get a premium price for organic, U.S.-grown quinoa and it was hard to sell." In his fourth season for Lundberg, Richard is cultivating 75 acres in Loleta and getting $1 per pound. Long-time friends Scott and Andrew Wilson are growing 25 acres of quinoa near Murray Field on a last-minute handshake with Lundberg — the brothers are unsure if they will grow quinoa at all next season. "It's been uncertain since the beginning," says Scott. "At first they had a lot of big plans but things changed." Lundberg did not respond to emails regarding its future plans, but hosted a press tour in Loleta last month to trumpet the 250 acres of Humboldt land dedicated to quinoa. Richard plans to continue growing his Wild Rose Farm brand for West Coast consumption — you might see it in bulk at some local stores. But he suspects most North American quinoa production will move to large-scale farms in the Midwest. "I think the price will continue to fall and it will have to be grown by the giant corn and soybean farms," he says. "If they have 5,000 acres in production and make $80 an acre, they're happy. Us little guys can't live on $80 an acre." Steven Saint is a freelance journalist whose work has appeared in Time and LA Weekly. Steven Saint is a freelance journalist whose work has appeared in Time Magazine, the LA Weekly and the Denver Post.